In a more gadget obsessed, fast-moving, politically dirty world than we live in now, hope is born. The House Theatre's production, Wilson Wants it All, written by Michael Rohd and Phillip Klapperich, presents a dark, yet hopeful interpretation of where our country could end up if political lines and politicians continue to split the country. 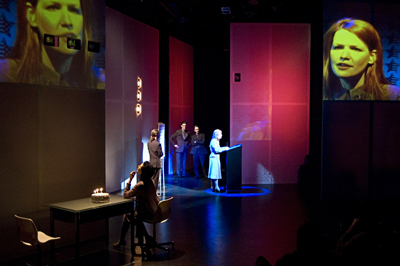 Wilson Wants it All incorporates technology in a believable and charming fashion, constantly drawing in the audience with multi-media extensions of the on-stage action. The complicated scene transitions move in and out with the speed of a Blackberry, and the fluidity of social media. But these models of communication are old news, in 2040, when the country has become fixated on a national savior- the daughter of an assassinated president who has been raised to save us from corruption, overpopulation, and depleted resources. John Henry Roberts as Wilson, portrays a lovably overwhelmed political advisor who has good guy and bad guy wrapped into a bundle of moral confusion. Although his motives are seeped in political gain, Roberts allows charm and compassion to shine through the title character. The theme of "Hope" flirts with cliche near the conclusion of the show, and audience members might be left wondering what exactly there is to be hopeful for, outside of the idealistic and unlikely chain of events that occur onstage. But the timeliness of the metaphors still manage to provoke comparisons to our own democracy and foreshadow the frightening possibility of the future of our country. The theme of family and nation, being one and the same, can give everyone something valuable to ponder, and will likely stick with you at the conclusion of the show. Wilson Wants it All is a successful statement that every American should consider. Wilson Wants it All runs through March 27 at the Chopin Theatre.